I would NOT buy that. There are some icons that are best left untouched. Oh please. What a waste. And teachers and bankers complain that people don't understand money NOW. When you reduce it to tokens and an ATM, you're even more disconnected from money and how much you have and where it's going. Not a good change for such a revered cultural icon like Monopoly. I'm keeping my old classic one, I'd try this too though ya3ne. 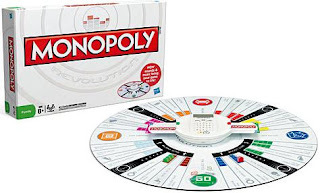 LoL when me and my brother were kids we used Monopoly’s money for various uses xD We even invented new games and used that money in them..
You sound enthusiastic about trying the new edition.. When you do please post your feedbacks ‘cause I am not going to buy or try it.. Yes people do piss me off when they ruin these sweet childhood games..
Sade2 7atta il game illi 3ala il PlayStation I didn't play it..
na, I'll stick to the old original one I guess.